City officials and community members at Saturday’s ceremony. Photo: Gold Line Foothill Extension Construction Authority. 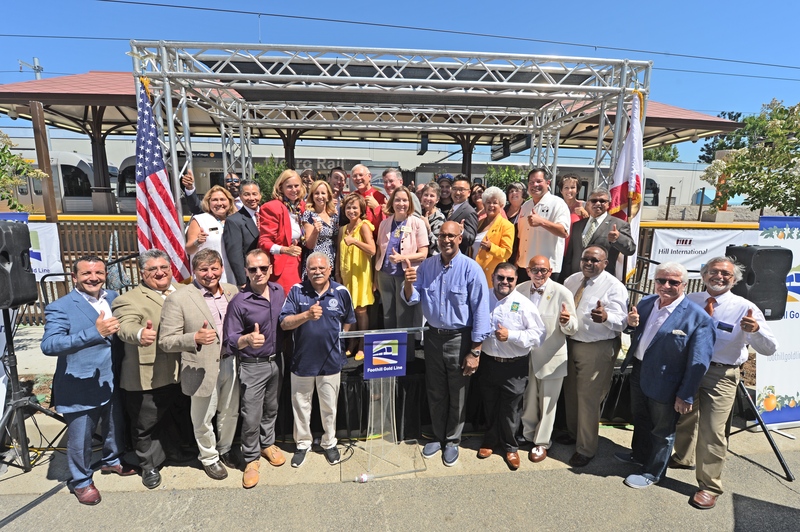 With construction almost complete on the Gold Line Foothill Extension, the independent agency building the project on Saturday began holding dedication ceremonies for each of the six stations. First up: the Duarte Station, located near the intersection of Duarte Road and Highland Avenue, about one-quarter mile east of the entrance to City of Hope. The station will include a 125-space parking lot. Below are the news release and the event program from the Gold Line Foothill Extension Construction Authority. The Authority will begin the process of turning over the project to Metro this fall. Metro will then begin pre-revenue testing and employee training with an opening in 2016. Before you ask: we don’t have an exact date yet! The project is funded largely by Measure R, the half-cent sales tax increase approved by Los Angeles County voters in 2008. Want to attend the other station dedications? Here is the info. Next up is the dedication for the Arcadia Station this Saturday (August 22) at 10 a.m. The new Gold Line Foothill Extension stations were dedicated in August and September 2015. Bicyclists take over the streets during “CicLAvia: Culver City Meets Venice” August 9, 2015. Very awesome about the Duarte gold line station. But can someone tell the politicians to quit with the goofy, gimmicky, thumbs up thing. Ugh. Awhile ago I read something about a potential ~1 mile bike path to connect the Duarte Gold Line station/City of Hope to the San Gabriel River Trail as part of the Emerald Necklace Bike Trail. Anyone know if this is happening or have additional details? I believe it was been funded by LA County DPW. Purple Line subway on the lower level. The Metro Blue Line opened on July 14, 1990.